…It’s about learning to dance in the rain. We began our week by playing in our flooded fields and marveling at the swiftly moving brook. After heavy rains, our outdoor landscape was changed for a couple of days and students both literally and figuratively “dove in” to exploring. After the waters receeded, the focus quickly changed to other outdoor pursuits, primarily, biking! Jumps were built and skills were tested as students brought their bikes to school while other students spent time on the Woods Trail working on their forts. Many projects took place inside such as creating Egyptian collars and headdresses, jewelry making, mummy bookmarks, and learning how to write using heiroglyphs, all in support of our Ancient Egypt Journey of Discovery. Numeracy and Literacy Workshops continue to explore a variety of concepts based on the skill level and knowledge base of each group. These Workshop times also complement Journey work and make it more meaningful. Journey time was spent finishing projects and setting up for our end of Journey Ancient Egyptian Museum Share. This final week was bustling with energy and excitement as students worked on their museum displays. Students explored writing and deciphering the magic Egyptian code of hieroglyphics, finally using this language to create their museum signs. Each room of the school was transformed with sugar cube pyramids, Nile river dioramas, mummies, canopic jars and god and goddess trading cards, each thoughtfully arranged and labeled. Students worked to finish up writing pieces to accompany each of their exhibits and created a Museum Store with tasty treats to sell along with their handmade jewelry and other handicrafts. After striking the set for our Cinderella production, Woodland students dove into our new Journey topic, Ancient Egypt. As we do with every new topic, we started with a brainstorm of what we knew and what we are curious about. Students had a lot of questions! In our Explore weeks we discovered the importance of the Nile River and created a living model of the Nile. We marveled at the seemingly impossible task of building pyramids and created sugar cube pyramids using our math skills to make choices about how big we could build them. We read about Egyptian Gods and Goddesses and created trading cards complete with picture and 'stats.' Using our theater skills, students put on a God and Goddess 'fashion' show. We ended the week learning about hieroglyphs and the Rosetta Stone. Next week students will choose topics to explore more deeply and prepare for their upcoming Journey Share where the school will be transformed into an Ancient Egypt museum exhibit. This week students worked on a variety of activities during morning Choice. Several students opted to either create, invent, or re-do their Cinderella costumes in preparation for Thursday’s “premier” at the White Mountain School. Glue guns, water colors and plaster of Paris were all out in full force as students made crowns, carriages, and masks. Other students simply had fun wearing their costumes and practicing their lines while in their full regalia. We also have a group of students who expressed an interest in learning how to write in cursive, so out came the posters, books, pencils and paper along with lots of giggles at the “fancy” writing! 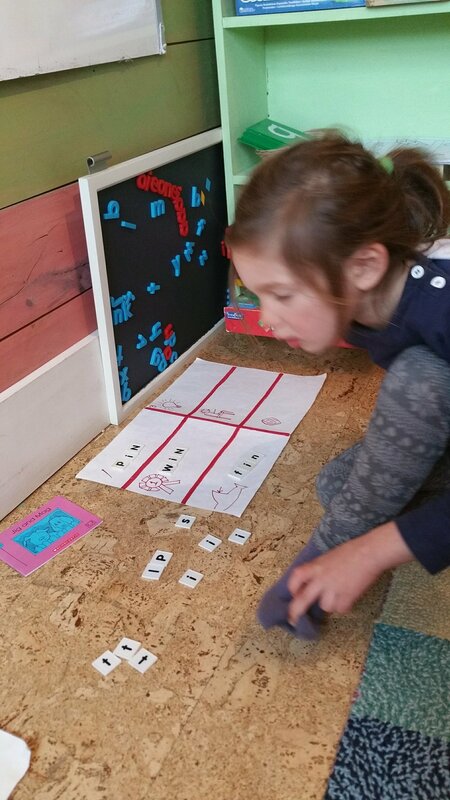 As so often happens in a mixed-age setting, one of the older students found himself in a teaching position as he worked with our youngest students teaching them how to write numbers following the Handwriting Without Tears technique of wet-dry-try. You guessed it , more giggles ensued along with a feeling of accomplishment for all involved. The warmth of early spring days was welcome both outside and on our enclosed porch as students reveled in the warmth of the sun’s rays and had a blast making mud pies and mud cakes by the bucketful. And of course, wherever there is a gigantic box, there is a gigantic group of students using their imaginations and having fun! A couple of somewhat warm days followed by lots of snow made for some outside fun both around school and skiing on the nordic trails at Bretton Woods. Students continue to work on preparations for the original Woodland production of Cinderella with attention being given to props, costumes, writing personal biographies, scripts, and running lines. Our Choice time this week was full of excitement around costumes, set design and play preparation. 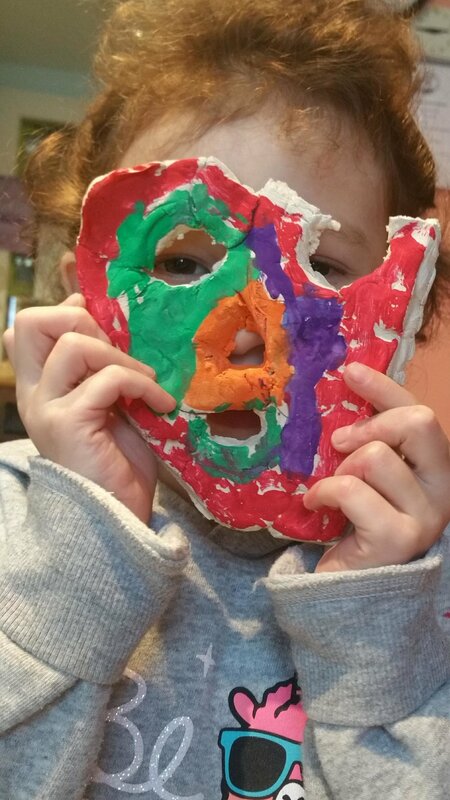 Inside, students created plaster bird masks, dressed up to act out fairy tales and started on set design for our original Journey production of Cinderella. Outside, students engaged teachers in a school-wide epic snowball battle! Students also explored ice fishing in the brook using pulleys and wood to create handmade fishing poles - and added hand tied flies as bait. This week in Journey, we continued our Theater exploration. Students chose the fairy tale Cinderella for our original production. Our Explore week was full of scene development, casting , script writing and costume design. We are working to integrate stage positioning, voice and sound of movement as we develop our version of the popular story. Becky continued to lead students in a variety of movement and voice warm-up activities to help students refine their original play. 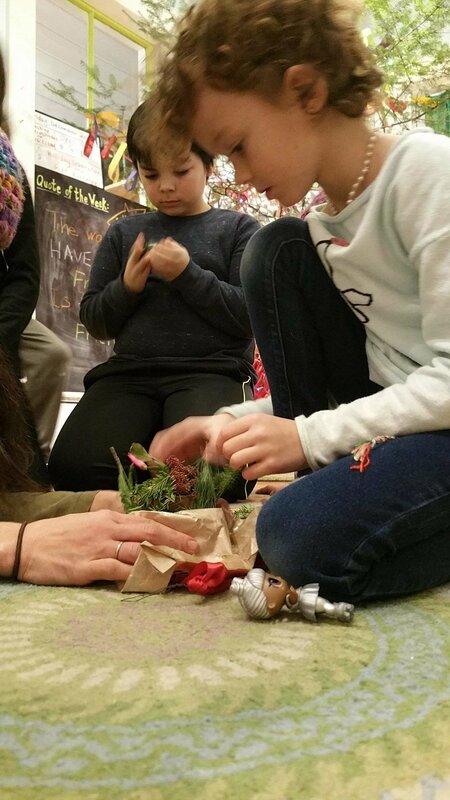 During Literacy, students worked on creating their own scenes for the Woodland version of Cinderella…stay tuned for our Opening on Thursday, March 28th, in the Black Box Theater at White Mountain School! Students have been practicing Reader's Theatre during daily Book Club. (Readers Theatre is a highly motivational reading strategy that provides a context for authentic reading. Students read to convey meaning using their voice, facial expressions, and gestures. ) A small group of students was really excited about this and used Choice time to create several paper bag puppets based on the characters from their play which they then used to tell the story. Students worked on several puzzles and one student fined tuned his 3D drawing skills. Mikaela returned for our Spring Quarter for group music class and individual music lessons, and students have been practicing their new skills during Choice. Outside, students have created a Fairy Village in the snowbank complete with a church, store, bank, movie theatre, bonfires, housing and a park with a waterfall! Embellishments were added with water color paints creating quote a colorful and fun tableau! We began our Theatre Journey this week with a special guest! Becky Cummings, actor/director/teacher extraordinaire, joined us to kick off our week of Exploration. In hands-on workshops, students learned about different elements of being an actor. We explored our voices, our movements, our roles as audience members, and our improvisational skills. We stretched our imaginations as we created new ways of entering and exiting the space, partner sculptures, and 1 minute plays. We brainstormed 20 questions that we had about theater and we will work towards discovering answers over the next few weeks. All students seem really energized and excited about being on stage and working towards our goal of creating a show! We concluded our week with our first of four Nordic ski days at Bretton Woods. Students gathered together for a lesson and it was a beautiful, sunny day at Bretton Woods. Inside choice this week included lots of excitement around the idea of sewing and dressmaking. Students chose their fabric and created patterns by tracing their bodies. The patterns were traced onto the fabric and hand sewn into beautiful dresses and shirts. 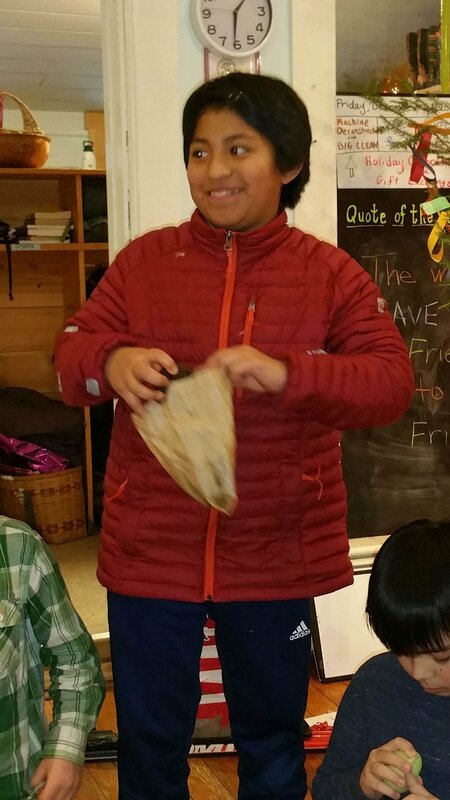 Paul and Cory led 7 students on an ice fishing expedition for an Offering this week! We traveled to Forest Lake and set up for a morning of catching Chain pickerel, bass, pumpkinseed and perch. Students used maggots and shiners for bait, learned how to use an auger to make fishing holes in the ice, learned a bit about reading the sonar, set up “tip ups” and used poles for jigging. Paul even taught the students about fish anatomy. This week's interim Journey topic was Winter Wonderland. Students explored the natural wonders of Winter through books, videos, art and collage. Afternoons were spent learning about snowflakes, winter animal adaptations and the history of skiing. We explored the woods trail on foot, skis and snowshoes, observing changes and searching for signs of animal life. February presents opportunities for activities both inside and out! Inside our cozy building students who wished to do so made Valentines and Valentine decorations which are now adorning the school. Cut out felt hearts sewn together and several feet of colorful paper chains are hanging along the Woodland walls. Gift bags were adorned with sponge painting and salt dough cookies in the shape of a heart were painted. A group of chefs made absolutely delicious strawberries dipped in chocolate which was a treat for the whole school on Valentines Day. Paul presented to the students about ice fishing and will be taking students out on the ice next week. 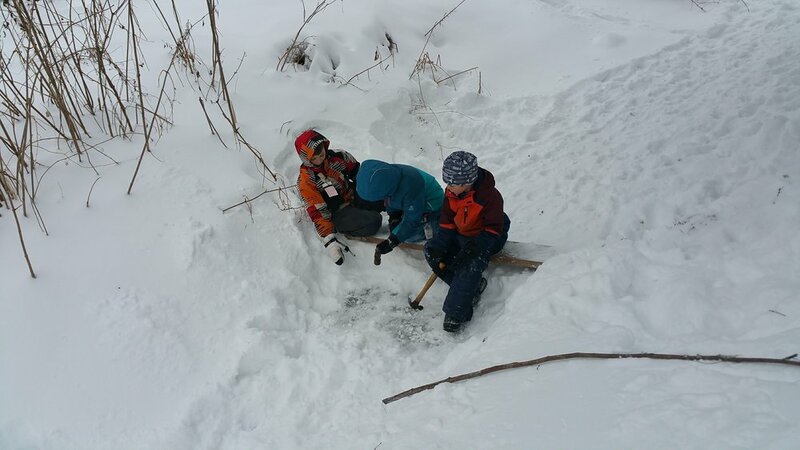 Outside, a group of intrepid explorers went out to the Woods Trail and discovered running water under snow and ice, icicles hanging from glacial erratics, revisited their previously constructed forts, slid like penguins down the snowbanks, and simply played and ran freely. We also had a very blustery and snowy morning tubing at Bretton Woods, though it sure was fun! Journey Share wrapped up our week as students presented their culminating Geography and Countries projects to their friends and families. From the Eiffel Tower to the Grand Canyon, Polar Bears to the Amazon, Switzerland to Australia, Japan to Rome and several points in between, we had a fascinating collection of student-generated work! We had an amazing day exploring the Fairbanks Museum in St. Johnsbury!. Students explored thermal imaging, bridges, propulsion and circuitry in the museums Exploration Station, as well as all the natural history artifacts and displays. Some students had the opportunity to actually see a particular animal they are studying during Journey such as the polar bear. A short walk to Cantina di Gerardo and a hands on pizza making experience topped off our day. Students learned how to work the pizza crust and then delighted in selecting their own toppings and then of course eating the delicious results. Thank you Colpitts/Grieco family! Mornings at school students learned how to weave with one student weaving a rug to place in her dollhouse at home. Icy conditions led to some very creative ways of negotiating icy surfaces. Books were read about “Your Elastic Brain” and the origins of pizza, and students brought in photographs and fun toys from home during Share. In Journey, students continued to research their independent topic choices for our ongoing Geography/Country Journey. Topics include: Big Ben, the Grand Canyon, Amazon Rainforest, animals of Australia, African animals, Madagascar, Switzerland, Paris, Japan, Antarctica, and the Colosseum. It's been such an interesting week as students gather at the end of each day to share their favorite fact they discovered. Towards the end of the week, the school was busy with activity as students began their project piece. Paint, cardboard, clay, popsicle sticks, felt, etc. were pulled down from the shelves to create models, posters, dolls, maps, and intricate drawings to represent their chosen topics. We look forward to next week's Journey share! Well, of COURSE we asked Emshika to come in and create with the students as we studied the continent of Asia! She brightened our day with her bubbly personality and gorgeous vegetables as she taught students how to make Thai spring rolls. Soaking the rice wrappers until they were “just right” and then filling them with a fresh assortment of vegetables and avocado topped with Emshika’s homemade hoisin sauce and peanuts…what a delicious morning! 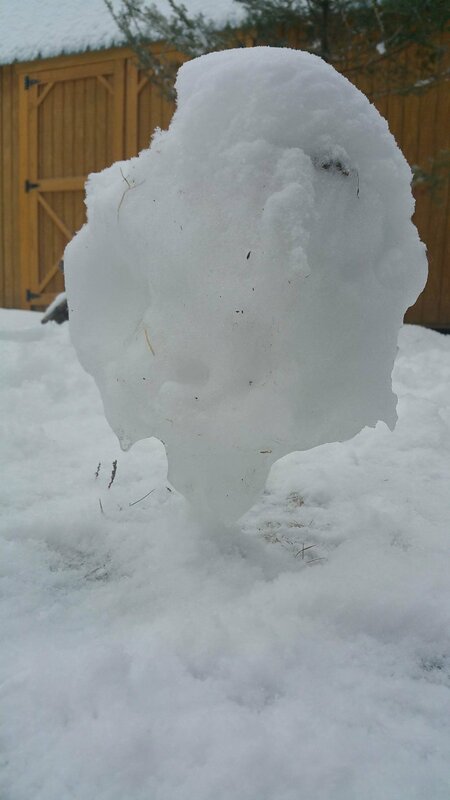 Outside, students played “basketball” and continued work on forts and snow/ice slides. 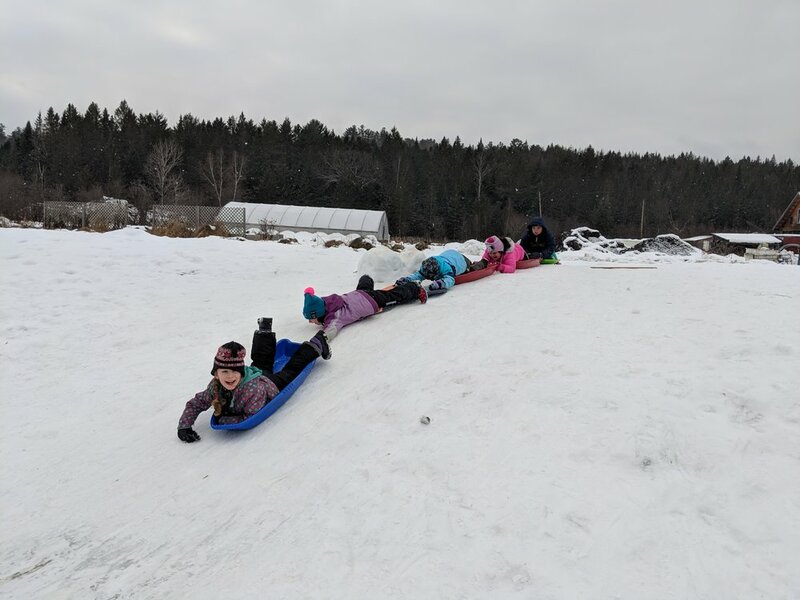 It seems our shovels make excellent sleds on the snow slides! 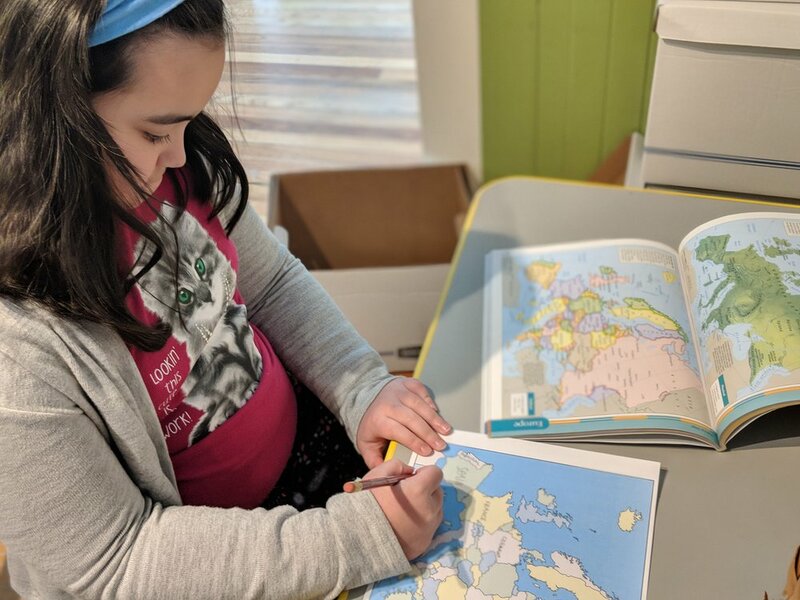 Inside students learned how to draw elephants, played with Legos and dress up, built several map puzzles, and put their artistic skills to work making flags of the world. Teachers facilitated an amazing JC conversation about “claiming” snow banks and forts as everyone shared feelings and challenges, and came up with a common list of actions. In Journey this week students took a tour of Asia, Africa, Europe, North America and South America. Each day students chose a subtopic of interest to explore pertaining to the continent of the day. Topics ranged from Machu Picchu in Peru, to the Sahara Desert in Africa, to Mt Everest in Asia, to the fjords of Norway in Europe, and many many more. Students came together at the end of each exploration to share their discoveries. Favorite discoveries included the mummification process of Pharaohs in Ancient Egypt, the flooding of the Colosseum to showcase ship battles, and the 1300 species of birds in the Amazon Rainforest. Next week we look forward to students choosing their individual topics for our Walk Around the World Journey share. Though we had such a short school week due to a weather-related closure and a holiday, students found plenty of time and energy to explore the humongous snowbanks outside! Our resident plowing experts (aka farmers!) 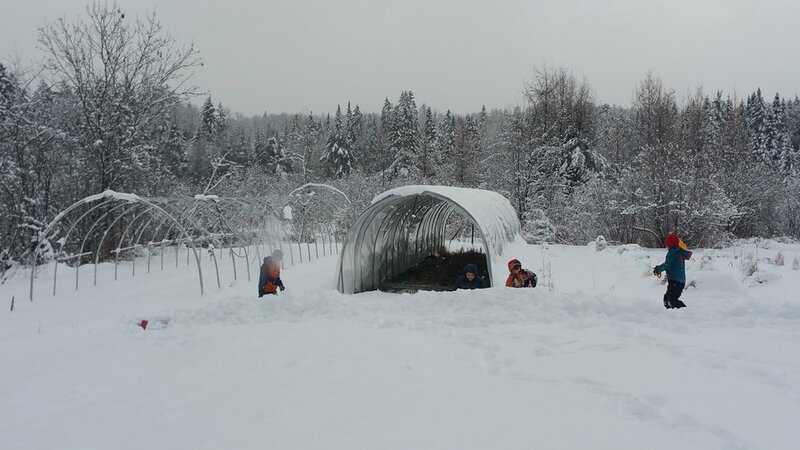 piled up the snow and set up the best opportunities for digging snow caves, snow slides, forts, and overall fun. One group of students, in particular, can almost always be found outside during morning Choice time at Woodland. 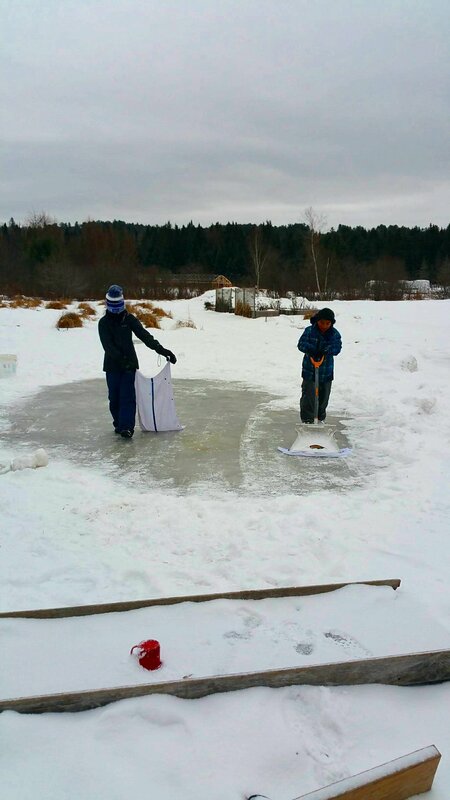 This week they walked on the brook testing the ice thickness, found spots where the water was still running underneath the ice, dug, shoveled, hammered and played. 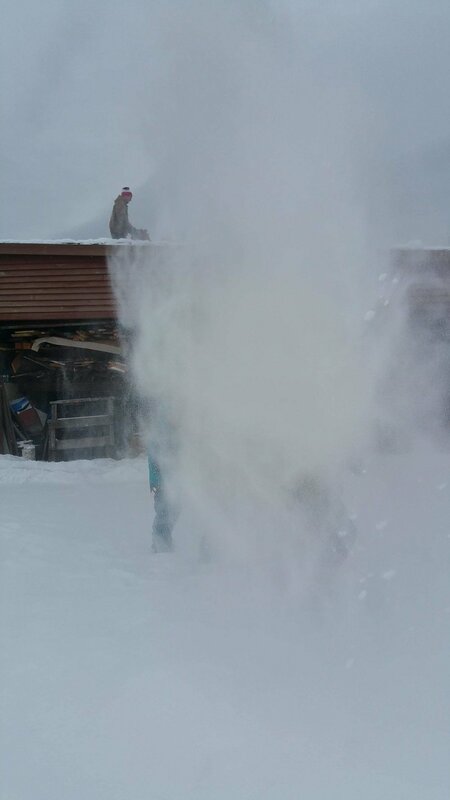 They also got to experience what it might feel like to be a polar bear in a snowstorm as farmer Matt blew snow from a roof, creating a very unique snow squall in our driveway! Warm and cozy inside the school, some students learned the art of Japanese fan making along with the cultural history behind making fans. Puzzles were completed, skip counting by two’s backward from 57 challenged some, books were read, and lively conversations occurred at both lunch and snack. “Martin’s Big Words” was read aloud followed by students writing a reflection on their own individual special gifts they have to offer the world. During Journey students learned about Antarctica and Australia, while skiing at Bretton Woods rounded out our 3 day week. 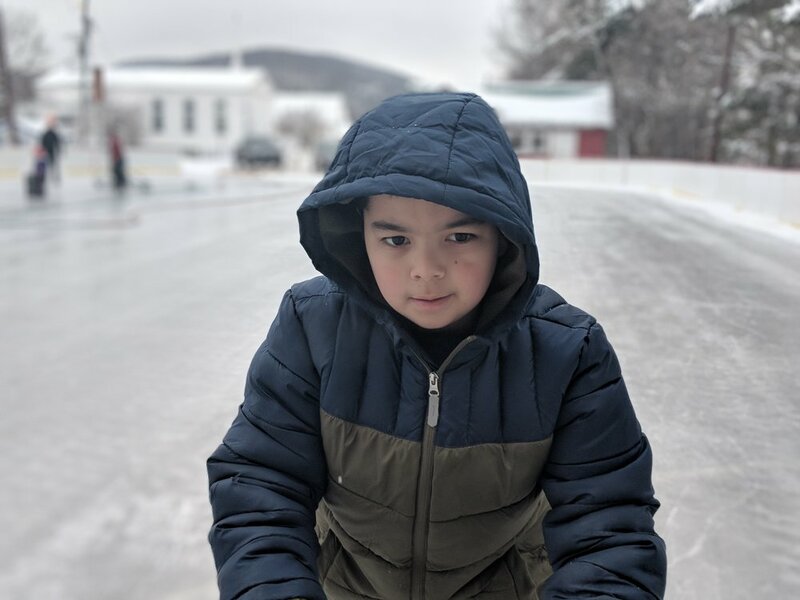 Our offerings this week included skating at the ice rink in Franconia! 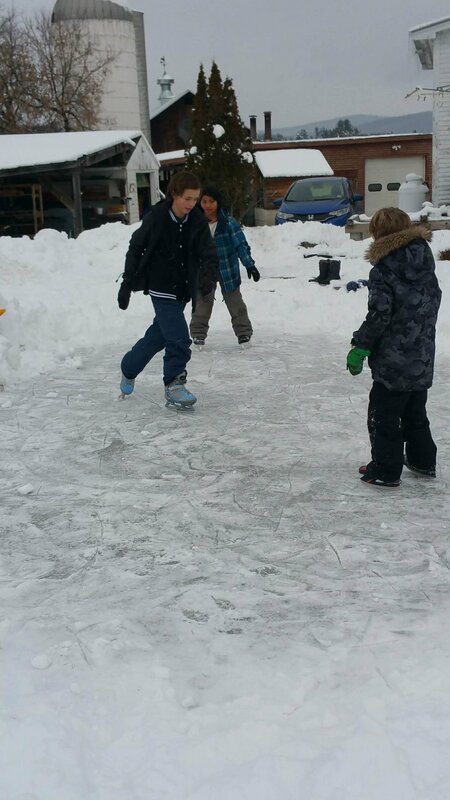 Students skated or slid on freshly groomed ice, falling, getting up, laughing and doing it all over again. Brent read a story to the group during snack in the warming shack and then the students hit the ice again before heading back to school. Another offering was that of mask making. Several examples of African masks were displayed and those who wished made their own mask out of clay one day, adding paint the next day. We had a special share this week as Emmy brought in her sister Jenna for share! 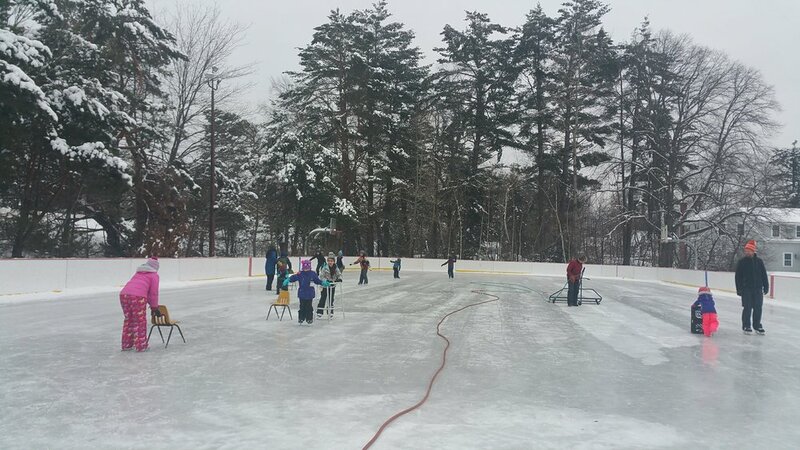 Students continued to maintain and skate on the homemade ice rink at school, make snow angels, and Friday was another fun ski/ride day at Bretton Woods. This week in Journey we have jumped into exploring maps. We have looked at many different examples of maps: political maps, climatic maps, physical maps, road maps, maps of rooms, treasure maps and even a map to show bird migration. To support our knowledge of our place in the world, we learned about the compass rose and had loads of fun playing interactive games to support this; one of our favorites was hiding a Lego guy and having students give directions incorporating north/south/east/west. Learning how to orient ourselves using a compass was also introduced. We used Google Earth to demonstrate all the different names for the place we live on earth; from planet, to continent, to country, to city, to road, to house. We had a blast flying around the world. The end of the week found students exploring different stations laid out around the school. Some examples of stations included: country flags, coordinates, my place on the map, Google Earth, compass activities and much much more. Next week we look forward to taking a deeper look at the continents as our Geography and Countries Journey of Discovery continues. Choice time on a winter day at Woodland is as varied as the Woodland students themselves! Frigid, sub-zero temps drove even our most hardy outdoor enthusiasts inside this week as Lego play became a center of activity. “Special” pieces were discovered, such as gold coins, and particular helmets for the figurines were re-discovered and put into play. One student experimented with making a stop motion animation movie using our HUE animation camera, while others played imaginative games building ships and creating make-believe scenarios. Students, who wished to, learned how to make cut out snowflakes which promptly led them to create a snowflake shop in order to sell their creations. Cash boxes were set up and money handed out in order to encourage the purchase of these gorgeous hand made snowflakes. 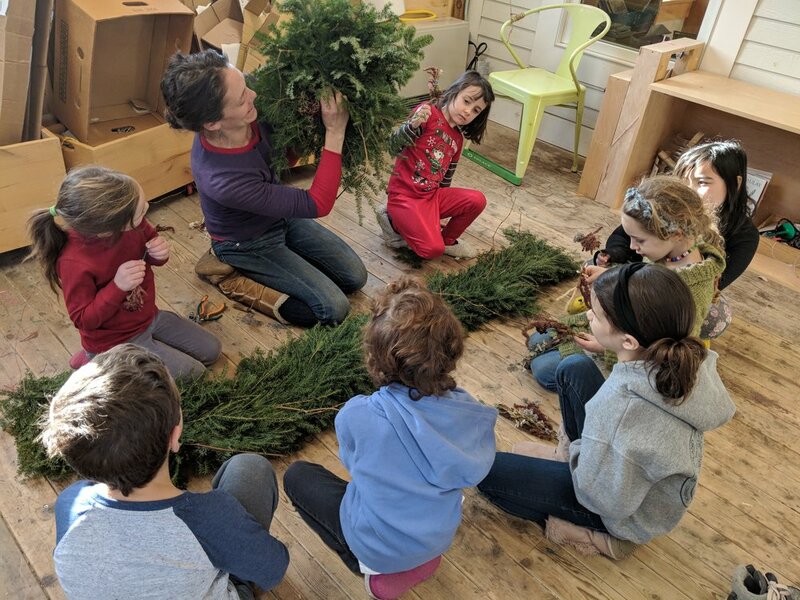 A trip to the ever popular wood pile also ensued as the students thought creatively about how to make a shelf in order to display their snowflakes! Another student wanted to replicate a picture of a weapon he discovered in a book, thus he worked intently one-on-one with a teacher learning about measurements and figuring out what materials he wished to use to make his own copy of the weapon. Outside, Ani figured out a way to use a steel shovel, a towel and warm water to emulate the effects of a Zamboni machine to make smooth ice. She collected bucket upon bucket of warm water, soaked a towel in the water, then used a shovel to drag the towel across already shoveled off ice in order to make the surface as smooth as possible. Some of our youngest students worked steadfastly on building a snow fort only to have it cave in as they attempted to dig out an opening. Undaunted, they simple went back to work piling on more snow and talking about things they might do differently next time in order to prevent a cave in. Students selected Geography and Countries as their next Journey of Discovery, we will tell you all about it in next weeks posting! Two days of school, to Bretton Woods, too much fun! 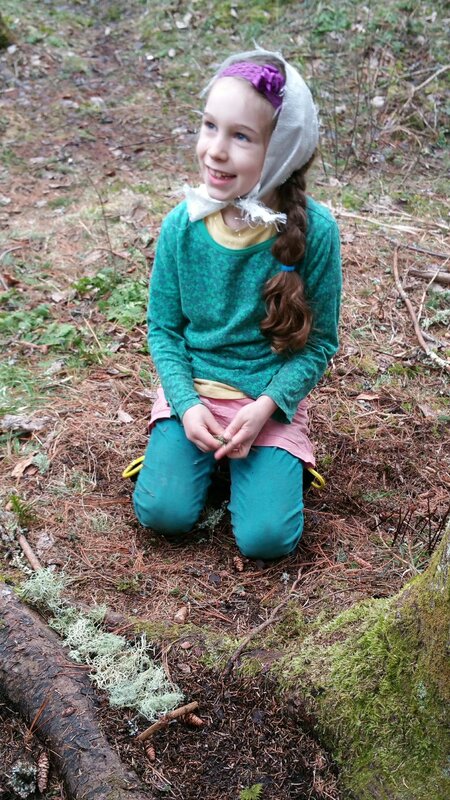 One of the most wonderful things to witness during Choice at Woodland is when students make their own discoveries and wonder at the natural world around them! Olivia and Pilot discovered undisturbed smooth ice under a couple of inches of fresh snow in several spots around the school. A gorgeous ripple pattern on the brook was noticed, along with the curiosity of what used to be a rather large snowball just balancing on a tiny piece of ice after recent rains and milder temps. When given unscripted time, it is always amazing what students discover and are drawn to on their own! 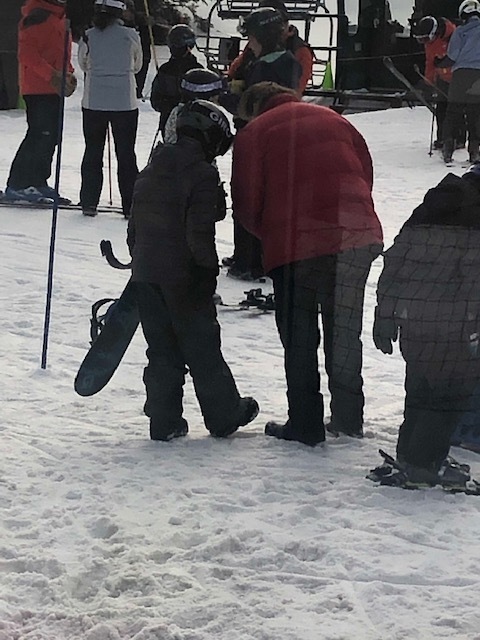 Our first day skiing and riding at Bretton Woods saw students overcoming shyness, fear, and other feelings that can be uncomfortable when trying something new. Others experienced joy and exhilaration riding the chairlifts and cruising down the slopes. Whatever the emotion experienced, we are so proud of our students for their strength and willingness to try something new and different! Discussions began about a new Journey of Discovery and a couple of the topics being explored are Life Under the Sea and Theatre. Hmmmm, might be interesting to combine those two??? Wishing you, our community, peace, love and joy. This week’s Journey exploration of simple machines included levers, measurement of force and distance, pneumatics and hydraulics. We traveled to the new space at WMSI for a workshop on pneumatics. 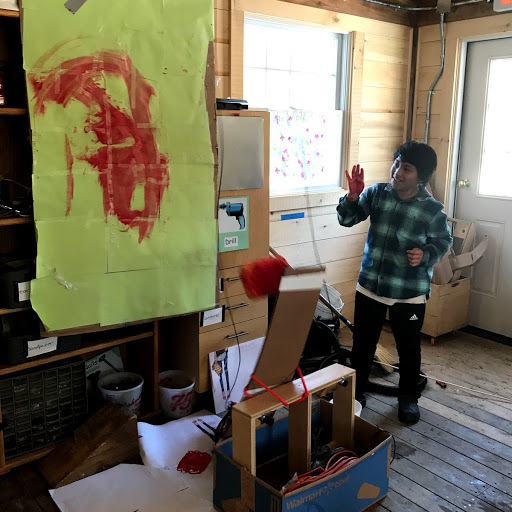 Students created rockets, dancing people and a cow jumping over the moon, all powered by their pneumatics simple machines. We wrapped up the week with students being offered the challenge to prove the idea that simple machines actually make work easier. Challenge accepted! Students collected data through several lever and inclined plane experiments and a spring scale, and we all agreed…simple machines make work easier! Outside play continued with an abundance of sledding and play in the snow. Inside play included construction of a “cupcake robot” making machine and the decorating of several dozen bags for Meals on Wheels. Renee led a morning of jam making, followed by a sampling of jam and butter on cinnamon bread, yum! 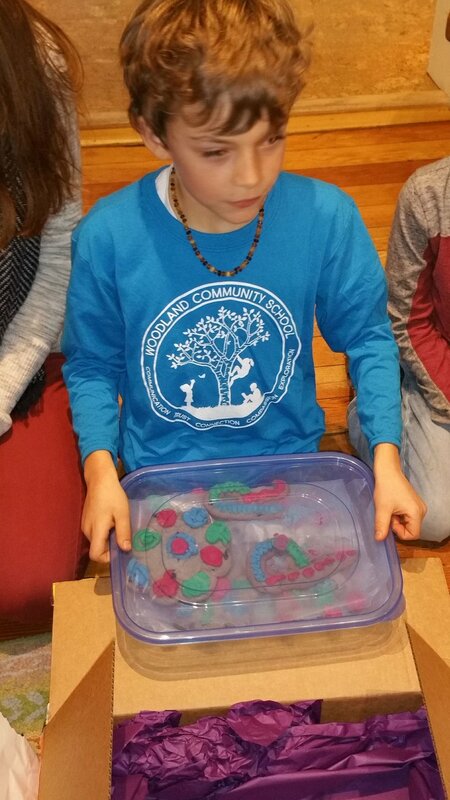 Our week ended with our first day of ornament making at Littleton Studio School.